Calico Pennant and ID book. Less obliging critters were netted, then carefully placed in jars or other containers so we could examine them up close. The group would gather around as James explained tidbits about its life cycle, or key identifying features. Once everyone had a look, they were set free to carry on with their day. James is in the middle with a butterfly in a jar. While investigating the meadow’s wildflowers, Sarah spied a little geometer moth caterpillar. The Geometridae are a family of small bodied moths who typically lay their wings flat when at rest. Their caterpillars are distinctive in their ‘inch-worm’ appearance, complete with a looping type of gait. In the photo below, its head end is up in the air doing an impersonation of a piece of vegetation, hoping to blend in and not be seen. Crypsis, or the Art of Not Being Seen, is the first anti-predation tactic of many caterpillars and moths. Caterpillar poop was one of the highlights. The top highlight of my day was getting to see this little caterpillar poop, then reach back, grab the poop, and place the poop on an adjacent petal. Bathroom habits of caterpillars are not something I’d given much thought to before, except the large quantities these little eating machines produce! An “inch worm”, not really a worm and also smaller than an inch. There were even butterflies on this butterfly workshop! Below is a Common Wood-Nymph in a net. Butterflies don’t always take off when you give them the chance, so we were able to get an up-close and unobstructed view of this beauty. There was some speculation that a couple of the straggling participants (myself included) may have re-captured a Common Wood-Nymph that the main group had just released, but no one actually recorded the licence plates of the butterflies in question, so it’s just conjecture and this may have been an entirely different Common Wood-Nymph. I’m not sure why it appears to have a beard. 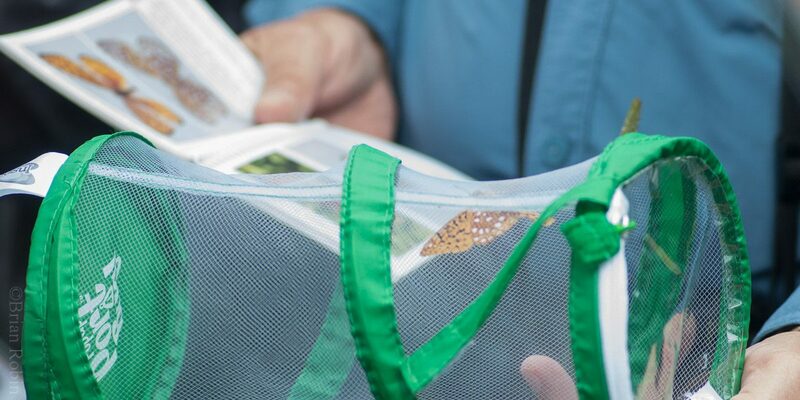 A standard approach to releasing a butterfly is to give it the option to sit on something pretty and photogenic. Often they just fly away, but sometimes they reward you by modelling in a more natural setting. This tactic worked on an Aphrodite Fritillary who content to just hang out on some wild basil while several of us snapped away happily. It would probably be next to impossible to ID from this angle, but it has more personality than a broadside shot. It also obligingly held its antennae up to show off the clubbed ends that typically separate our Ontario butterflies from our moths (there are exceptions). Look into my silvery spotted wings! It’s always great to get out with experienced naturalists to see how they operate. While I’ve been interested in moths and butterflies for years, I confess to being almost entirely self-taught and to not even holding a butterfly net since I was probably 10 years old. It was something to see James spy activity 50′ away then go streaking off, net in hand, and come back with a wee hairstreak butterfly (as shown in the riveting action shot below). James demonstrating his accuracy with the net, there’s a tiny butterfly there somewhere. I confess to not looking at this netted butterfly up close, I was distracted by a pretty little moth that he flushed during the chase. It’s never “Just” a moth. Below is the ragged, but still kinda fancy looking, Large Lace-border. It is one of the geometer moths, note the flat wing position and relatively tiny body. It’s fairly small with a wingspan of about 25mm and is one of several ‘little white jobbies’ that would periodically flush from the long grass as we made our way through the fields. It also looks like part of a doily. A photography tip for tiny subjects – the depth of field (amount in focus) at high magnifications is very small, so to get a flat subject in focus you’ll get the best results if you can position your camera so the sensor is parallel to the subject. For the moth above, I wasn’t able to shoot it head on due to vegetation in the way, and as a result the right wing is fading out of focus. Another Large Lace-border, found at my porchlight a few days later. This is the same species of moth, but at my porchlight and under more controlled conditions I was able to position my camera so I was shooting straight at it to get the entire moth in focus. I was also using an electronic flash so camera shake was eliminated, and I could use any ISO and aperture I wished for optimum quality. Another key was being alone, not trying to keep up with a group of people (photographers often get left behind! ), and being able to work at my comfortably glacial pace. They really liked the rudbeckia flowers, and miniature dramas could be found on the blooms. In the scene below, an ambush bug waits patiently while a weevil either plays dead or is actually dead. What happened? Did the ambush bug kill the weevil then return to hiding as we walked past? Is the weevil playing dead after a tussle with the ambush bug, hoping to be left alone? Are they completely unrelated? Ambush Bug and a Weevil. All in all, it was a great way to spend a morning – a knowledgeable guide, a flourishing meadow, my camera, and not getting struck by lightning, what more could you want? A big thanks to James and Ontario Nature for putting on this event, I look forward to crossing their paths again! Ontario Nature has a small online Butterfly and Moth Guide to get you started. The ROM Field Guide to Butterflies of Ontario and the Peterson Field Guide To Moths of Northeastern North America are great print references if you want something more involved. Bugguide.net is a great catch-all for insects and arachnids, and if you’re on Facebook, you can check out The Insects and Arachnids of Ontario. For events near you, try contacting you local field naturalist groups- mine is the Owen Sound Field Naturalists, with Saugeen Nature also nearby.